A plaque/trophy hybrid, this award is how you combine both for a unique acknowledgement of achievement. Mount the trophy figure of your choice to the base and personalize the "billboard" with a plate or even a photograph to create an award perfect for shelf or tabletop display. 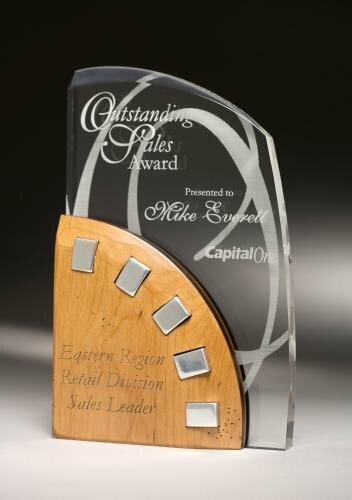 This black marble finish award is available in 4 sizes to meet your award needs. A plaque/trophy hybrid, this award is how you combine both for a unique acknowledgement of achievement. Mount the trophy figure of your choice to the base and personalize the "billboard" with a plate or even a photograph to create an award perfect for shelf or tabletop display. This cherry finish award is available in 4 sizes to meet your award needs. A plaque/trophy hybrid, this award is how you combine both for a unique acknowledgement of achievement. Mount the trophy figure of your choice to the base and personalize the "billboard" with a plate or even a photograph to create an award perfect for shelf or tabletop display. This matte black finish award is available in 4 sizes to meet your award needs.